Who has a lot of opinions about what Kate Middleton should wear the day she becomes a princess? Designers, that's who! From Karl Lagerfeld, who favors "high boots," to Christian Lacroix, who designed an Elizabethan bodice, everyone has a fantasy. Alberta Ferretti, whose dress is shown here on the left, likes the idea of Middleton in "an embroidered, fluid-silhouette dress in precious fabrics that will help her make an everlasting impression." The results sort of look like moss growing between flagstones. Badgley Mishka, right, say, "We see Kate going completely classic." Apparently, to Badgley Mishka, "Classic" equals a bedazzled off-the-shoulder get-up worthy of Dynasty. Ralph Rucci's dress, left, meanwhile, has a funnel neck and a skirt embroidered with tiny gathers, "like ostrich pores." And while it would be pretty rad if Kate Middleton were to wear Chris Benz's yellow floor-length frock, right, the likelihood of this eventuality is roughly nil. Benz knows that; I'm glad he had some fun with the design brief. Christian Lacroix's awesome collage reinterprets Middleton as a kind of Victorian doll. He thinks she should wear something red, "as red was the wedding color until 1900!" Elizabeth Emanuel, left, designed Princess Diana's wedding dress in 1981. And apparently her taste remains of the era. Here's a surprise: Gucci's dress, right, is actually quite tasteful. Jason Wu's dress, left, is a little fussy. My personal favorite, unexpectedly, is probably J. Crew's design (right). 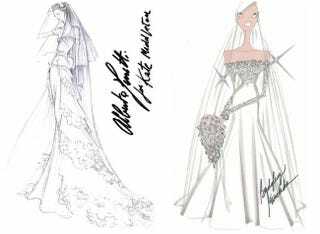 "I think that there will be so many comparisons to the late Princess Diana that her dress should almost be the opposite of what Diana's was — modern, simple and very elegant," explains the brand's wedding division head, Tom Mora. He's right, and a simple long dress with a train, its open back balanced by long sleeves and a demure neckline, would be quite lovely for any bride weary of the ubiquitous wedding aesthetic of white, poufy, and strapless. Karl Lagerfeld, left, thinks Middleton should wear "the Victorian wedding dress, with a twist — high boots and open in the front." Meanwhile, Lela Rose's dress, right, is just so pretty! Lyn Devon's (left) looks like a lampshade being shoved into a cardboard toilet paper roll. Says Angela Missoni, right, "This dress was designed to enhance Kate Middleton's beauty through precious fabrics. The clean and contemporary lines, never redundant and beyond all specific stylistic periods, give her an eternal image of grace and elegance." Smile and nod. Nanette Lepore says, "A patchwork lace dress reminds us all that a true princess can mend and make do!" Prabal Gurung's dress, left, is all drama and attitude. Me likey. Rachel Roy's ensemble, right, makes me wonder why more brides don't wear "a wonderfully beautiful, yet modern hat worn under a full-length veil." I guess from the picture on the left, we can surmise that if Tommy Hilfiger actually had a bridal line, it might not be horrible. Little-known fact: Valentino designers Maria Grazia Chiuri and Pier Paolo Piccioli designed this dress, right, entirely from ruffled valances they found at Goodwill. They say they imagine Kate Middleton "as a new Botticellian Venus." It wouldn't be a fantasy bridal wear round-up if the queen of bridal fantasies, Vera Wang, weren't included. But truth be told, her number is less fantastic than it is conservative-veering-on-boring. It's tremendously unlikely that Middleton will wear any of these dresses, because as a future Queen, she will probably stick with a British designer. (The money was on Bruce Oldfield, until so many people were punting such extraordinary sums that the betting was suspended.) So this fun bit of escapism has no intersection with reality whatsoever! Thanks again, fashion.